183/365(+1), a photo by Luca Rossini on Flickr. The same family friends who invited us yesterday at their pool at Cala Piccola offered to bring us sailing today. They own a nice sailing boat, 12 meters long. We met this morning at 10 am and left soon after the harbor of Porto Santo Stefano directed to the island of Giglio. Giglio is one of the most beautiful places in the sea of Tuscany. It’s a small, rocky and mountain-shaped island, with a little medieval harbor and an ancient castle-town on the top of the hill. Very few roads connect the harbor, the top-of-the-hill town, and the largest shore, with the rest of the island accessible solely by sea or hiking. It’s really a jewel, well known to Brits and Germans who every spring and summer populate the island. But since the 13th of January 2012, it is world-wide known for being the place hosting the biggest shipwreck on planet Earth. In perfect Italian style, the sinking of the Costa Concordia wasn’t a epic tragedy, anything similar to the Titanic, it would have been more an epic farce, if it wasn’t for those 30 people who died and the 2 who disappeared. The huge wreck, much larger than the harbor-town of the island, is the biggest monument to our overbearing and generalized lack of wisdom. 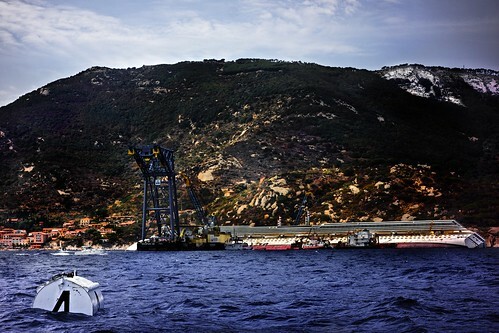 The captain, Francesco Schettino, is obviously retarded. Someone who deliberately puts so many people in danger because of his recklessness or benefits can only be addressed as a retarded. Full stop. And yet, he couldn’t have done all this mess by himself. According to the blog of Costa Crociere, he wasn’t new to cruising so close to islands, a nautical practice called “to make a bow”. Now, as far as I know, the most important attribute of all these “bows”, the one that is completely missing in all the posts of the blog, is that it’s ILLEGAL. But apparently, Costa Crociere didn’t mind, nor did the port authorities of all these islands. Now, you surely need a retarded to sail a huge cruise at less than 100 meters from the coast of an island and wreck it in place where the presence of rocks is well known and fully reported on maps and radars (we’re not talking about an unexpected iceberg here! ), but yet our retarded couldn’t make such a mess if he wasn’t working in a country largely ruled by “menefreghismo” (why should I care) and “insipienza” (total lack of wisdom) as Italy sadly has proven, once more, to be.